A large majority of those polled believe that seats should closely match votes. 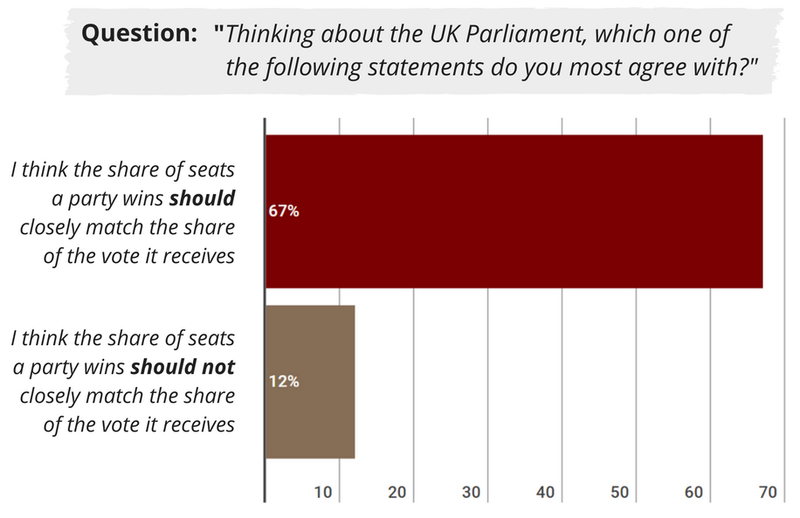 Just 12 per cent said seats should not match votes, with 21 per cent saying they don't know. Among Labour voters, support for the principle jumps to 73 per cent. Support is also marginally higher among Conservative voters than among the general population - but so too is opposition, with 15 per cent saying seats should not match votes. 76% of Labour voters said they would support a commitment by the Labour Party to change the voting system so that seats match votes - suggesting that there would be broad support for the inclusion of such a policy in Labour's General Election manifesto. Most of those polled believe that a party with less than 50 per cent of the national vote should not have the right to govern the country on its own, with 30 per cent saying the opposite. Opposition to minority rule is even stronger among Labour voters. Conservative voters were the only demographic among those polled in which more people thought a party should - rather than should not - be able to govern alone without majority support. 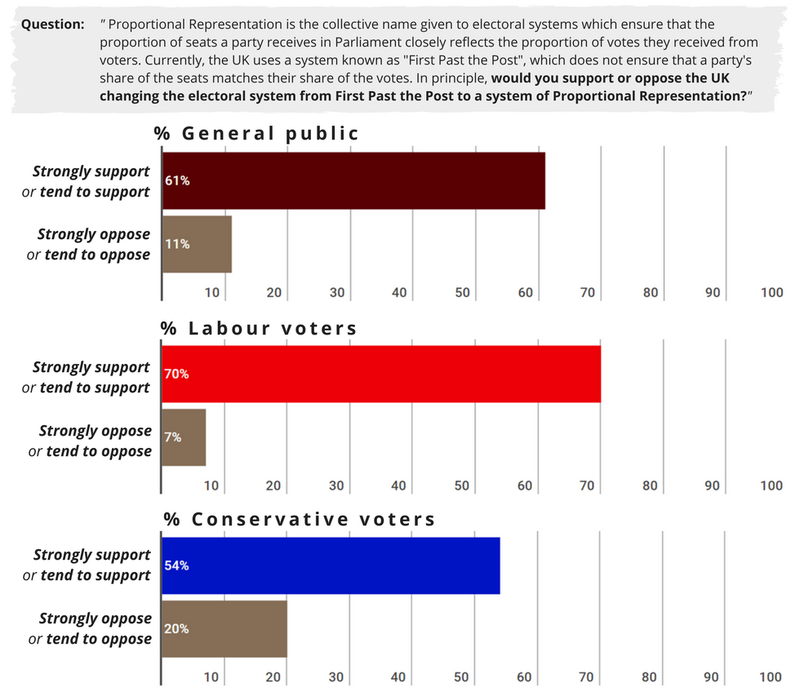 Supporters of First Past the Post have sometimes tried to dismiss polls showing support for the principle of proportionality by claiming that if the questions had mentioned Proportional Representation by name then people would have answered very differently. To test this, we posed the question in terms of "changing the electoral system from First Past the Post to a system of Proportional Representation". Although this did have an impact, it was a very limited one. A commanding majority remained supportive of a move to PR across the general population, Labour voters and Conservative voters. The results are consistent with all other recent polls on the issue, which have uniformly found strong support for Proportional Representation. This adds to the growing body of evidence showing that most people would support the adoption of PR for UK General Elections. The poll of 2,578 people was conducted independently to professional standards, and included a robust statistical sample of both Labour and Conservative voters. Full results can be viewed here.